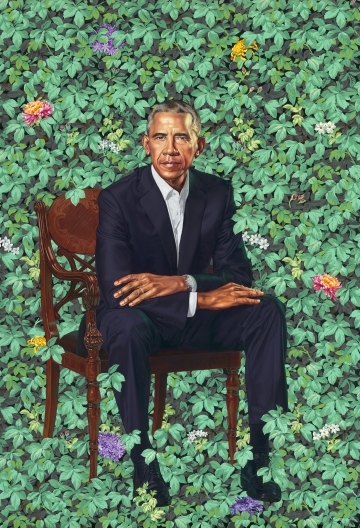 Ever since Kehinde Wiley and Amy Sherald’s official portraits of Barack and Michelle Obama were unveiled in February, attendance numbers at Washington DC’s National Portrait Gallery have exploded. So much so that Sherald’s portrait of Michelle Obama was recently moved to a different part of the museum ahead of schedule in order to accommodate the crowds. 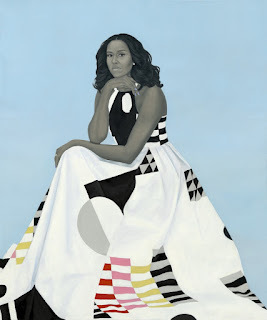 In a phone interview with Hyperallergic, National Portrait Gallery director Kim Sajet was hesitant to compare the number of people who came to see each of the new portraits, but she did say that Michelle Obama’s is the most popular portrait of a first lady. Sajet attributed this popularity to “the magic of Michelle’s presence: her statuesque pose, flowing dress, and direct gaze” in Sherald’s portrait. The viral photo of two-year-old Parker Curry standing in awe in front of it hasn’t hurt either. As for numbers, Sajet said attendance is breaking records. In February of this year, 176,700 visited the museum, which is more than any single month in the past three years. On March 24 alone, the day of the March For Our Lives, 35,968 people visited the museum. 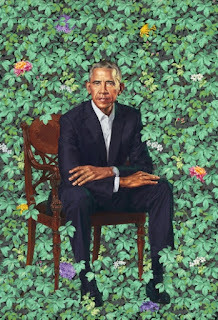 That same day, Sajet said there were so many people in the Presidential portrait gallery that the museum had to close off the space for a while and wait for people to peter out before letting others in. Meanwhile at the museum store, sales have increased more than 200% and it’s hard to keep the Obama merchandise in stock. “The first shipment arrived on a Friday and was already sold out that Sunday,” Sajet said.